It's nice to see a secondary character take center stage, like Eva in Center Stage. Just kidding, of course -- with her attitude she's lucky she even made the company! 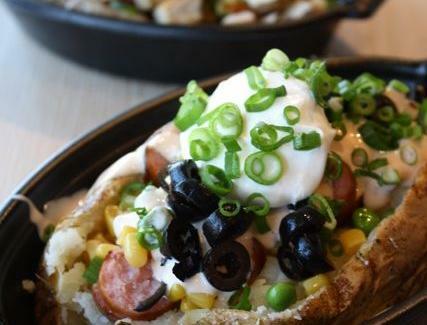 Taking center stage in your mouth, the baked potato, at Hot Spud. 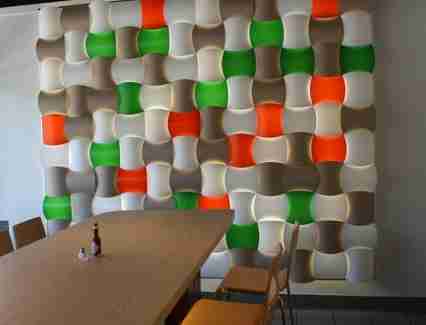 From a Cafe Gratitude alum, HS's a casual, sit-down/take-out nook (modestly done up with odd illuminated wall treatments, a big open kitchen, etc.) that's here, simply, to serve you delicious riffs on the ubiquitous baked potato -- incidentally, SF's last all-spud joint was opened on Pier 39 by former District 8 Supervisor and Harvey Milk assassin Dan White... so the karma contest is Hot Spud's to lose. Their six signatures consist of 12oz, convection baked potatoes filled with grilled toppings n' sauces, beginning with a chicken number (with bacon, hot wing sauce, sour cream, corn, black olive...) and the Sausage Spud stuffed with corn/peas/green onions, and slathered in Thousand Island-esque "Stadium Sauce", which up until right now, everyone assumed was beer. Other standouts include the Steak Spud (with sauteed mushrooms, peas, corn, green onion, and Alfredo sauce), and "The Wharf" -- a seafood option consisting of crab meat, corn, red/green onion, lemon beurre blanc sauce, and...free tix to the wax museum (JK, but seriously check it out, they've got Silver Screen Comedians!). You can also make your own spud using four veggies, one sauce, and your choice of meat a la carte. Then wash it all down with one of HS's five domestic beers, all of which go down smooth, unlike Eric when he sprained his ankle in rehearsal right before the big show. Oh Eric, what a spaz.